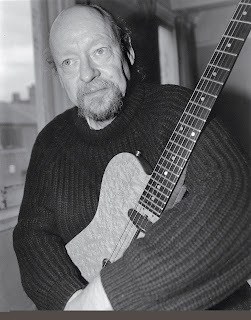 Peter Bocking, who died two days before his 67th birthday on October 31, 2009, was a hidden jazz guitarist, revered equally among his peers on the North West beat group scene, and the US blogosphere. Neither group knew of the existence of the other. Recorded evidence of his playing is scarce: Yes I Do, a 1963 Decca single by Peter Maclaine and The Clan (the song, which Bocking co-wrote, was also covered by Freddie and The Dreamers); a white label acetate of Sunshine Superman bw Eleanor Rigby, made by an organ trio of Pete ‘Quatermass’ Robinson, Bocking, and drummer Geoff Mullin in 1968; sideman on Goodbye Brains, a 1972 offering from Coley, a vehicle for saxophonist Barry Cole. Since his death, some recent private recordings made with singer Kate Fox have surfaced on the web. And that’s it. On the face of it, not a lot for a lifetime in music. Yet Bocking, born in Withington in 1942, was an essential part of the sixties Manchester music scene: an instinctive jazz guitarist surrounded, by an accident of time and placet, by Merseybeat. The simplicities of beat music were not enough for Bocking. ‘Surely there were more than three chords? I’d counted the frets on a guitar. They were definitely twelve. They must be there for a reason, but what?’ he mused. The record that set him on his path was Bill Haley’s Goofin’ Around, a showcase for guitarist Franny Beecher. Another formative influence was James Burton, the tasteful picker on Everly Brothers records. Don and Phil were the avowed role models of the Two Teens - otherwise Graham Nash and Allan Clarke. The Two Teens shortly joined forces with Manchester’s first rock ‘n’ roll combo, Johnny Peters and The Jets (including Peter Bocking), to become The Fourtones. ‘Back then, everyone was called Johnny,’ recalled Bocking wistfully. Before The Fourtones could evolve into The Hollies, however, the guitarist left to form the Pete Bocking Six, proposing a pioneering fusion of jazz soloing and rock riffing. The adjective ‘powerful’ crops up in eyewitness accounts of live performances. With a fine disregard for the literal, the line-up of the Six was very elastic, and might include multiple saxophonists and bassists. When they supported the Beatles at the Oasis in December, 1962, Paul McCartney borrowed Butch Mepham’s Fender bass guitar and scratched the varnish with the oversized buckle of his stylish belt. In 1963 Bocking was hospitalised for six months with ankylosing-spondylitis and emerged to a changed world. The talent scouts who had combed the North West for the next Beatles had packed up and gone home. Bocking drifted into session-work, palais bands (“some of the stories would make your toes curl...’) and touring bands, visiting Las Vegas with Lonnie Donegan in 1972. By the mid-eighties, live work had been supplanted by teaching: (uture jazz star Mike Outram was a pupil. He was semi-retired when I first saw him, playing blues with Victor Brox (legendary bluesman and character) and, shortly afterwards, pub-rock with Charlie Darlington. The latter was the landlord of The Star and Garter, a lugubrious Victorian pile next to Piccadilly Station. It was a loose arrangement. Charlie gave Peter a pup from his dog’s litter - the much loved Jasper, a Belgian Groendal - and Peter would sit in with Charlie’s band. But I still hadn’t heard Bocking play jazz. It was a revelation when I did. He was a master with an orchestral conception: laying down a bass line, and filling in with vamps or walking chords whilst playing an independent melody, often with quite startling interval leaps. The clean attack of the line owed to jazz masters Tal Farlow and Barney Kessel; the colours and inflections recalled the impressionism of Debussy. Yet his wider fame rests on non-musical talents. His death was greeted with an outpouring of grief from US blog sites, where PeterUK’s contributions had become legend. For example, here is PeterUK enlivening the staid is-Barack-a-black-Lincoln debate: ‘There is some European socialist in him, so perhaps he is a Lincoln Continental.’ PeterUK’s comments have been collected on several sites. In a sense, Bocking surpassed the achievement of his great Merseybeat peers, the Beatles: he conquered America without ever leaving his armchair. Peter Bocking married and divorced twice - to ‘unknown’ (he never talked about his first marriage), and to Maria, in the mid-nineties. He was predeceased by his mother, Harriet, in 2003, and leaves no family. Incidentally, please find selections from Peter's old correspondence scattered in 'comments' boxes around the site. This might seem a bit spooky, but I believe I'm justified on grounds of public interest. 0 Responses to "Peter Bocking"